Believe it or not, I have three favorite colors and they just happen to be, red, white and blue. I have been blessed to live in the country and to have seen over our back yard, two bald eagles soaring in the sky. 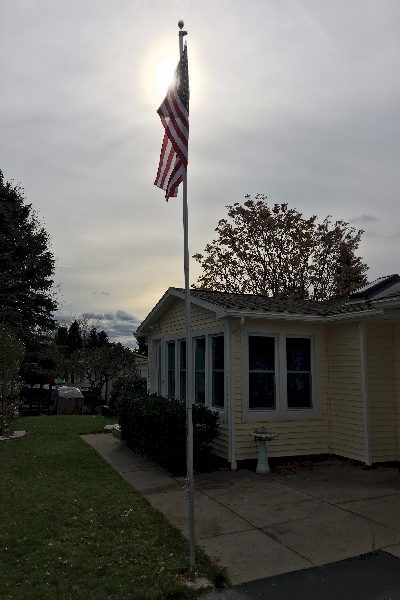 I may not be brave, but I still live, “in the land of the free and the home of the brave.” As of October 30th, 2015, we now proudly have a flagpole, for our “stars and the stripes”—“Old Glory,” the flag of the United States of America. The pole was a gift from a Vietnam veteran to a Navy Veteran and he not only gifted me with this honor, but he also helped me to install it. Thank you, Mat Burton, my friend. I thank you unknown Vietnam veteran and Mat for your service to our country and for this blessing which now graces the outside of our home that we affectionately call, ‘The Gathering Place.’ May countless numbers of people ‘gather’ here to behold it and may it ever wave in the land of the free and the home of the brave! I promise to do my best to honor and respect this gift and all it represents. This is called a tacit (implied, but non-spoken) oath and carries the same force as if it were spoken. But no such or any kind of sworn, spoken or implied oath was ever intended, by any citizen of the United States of America. Oaths were only for new citizens, the military and those that actually, really and truly, work for the government. And that oath was not to God, the heavens, a royal, or to the earth, but to a thing, the Constitution of the United States of America. From a Puritan’s standard, like William Penn, who opened the doors to religious freedom and planned the city of “Brotherly Love,” (Philadelphia, PA), our founders were opposed to oaths. But realizing that it is not a crime to do nothing, they understood that all those working for the government had to do was just show up and collect their paychecks—that’s it, nothing else. So they made it a requirement to swear an oath to a thing, the Constitution of the United States of America, to hold them to accountable and if not, they would be guilty of perjury (lying under oath)! I do not know what the flag, our flag might mean to you, but I can tell you what it means to me. I know whom my God and Father is. He is MY “Chief” And I know of Him, by Him and For Him, this republic that was just a whisper, became a shout heard all around the world! “I – – Me; an individual; a committee of one. With my right hand still over my heart, I will sing daily, to the best of my ability, the first stanza of the National Anthem. Our flag, my flag, I fold you first as a symbol of life. This second fold is for the belief in eternal life. 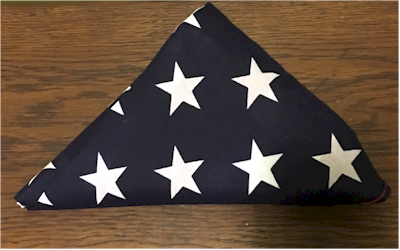 This third fold (the first triangle) is for the veteran that gave a portion of their life to defend this country and to extend peace through Liberty, to the entire world. The fourth fold is for our weaker nature that we must turn to God in times of peace and war, for His divine guidance. The fifth fold is for grace, to find favor in dealing with other nations. We may be right or wrong, but this is still our country. The sixth fold is for where the heart lies. It is with the heart that I pledge allegiance to the flag of the United States of America, and to the republic for which it stands, one nation, under God, indivisible, with liberty and justice for all. The seventh fold is for our Armed Forces that protect our country and our flag, against all enemies, foreign and domestic. The eighth fold is for every mother who has entered into the valley of the shadow of death and for whom this flag flies, on Mother’s Day. The ninth fold is a tribute to all women that through their believing, love, loyalty and devotion, the character of the men and women who have made this country great, have been molded. The tenth fold is a tribute to all fathers, for they too have guided and given sons and daughters, for the defense of our country. 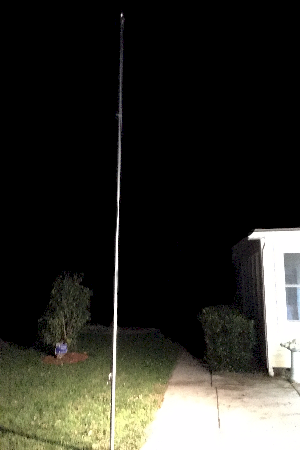 During inclement weather, heavy winds and after sunset, this flag will either NOT be flown or taken down and folded. And finally, on some occasions I may read the words or play a recording of the beloved ‘TAPS,’ day is done. I will place the flag at half-staff, hoist it to the peak for an instant and lower it to a position half way between the top and bottom of the staff. The flag is to be raised again to the peak for a moment before it is lowered. On Memorial Day, the flag will be displayed at half-staff until noon and at full staff from noon to sunset. The flag will be flown at half-staff in mourning for designated, principal government leaders and upon presidential or gubernatorial order. “FLYING THE FLAG AT HALF-STAFF: The pertinent section of the Flag Code says, “by order of the President, the flag shall be flown at half-staff upon the death of principal figures of the United States Government and the Governor of a State, territory, or possession, as a mark of respect to their memory. In the event of the death of other officials or foreign dignitaries, the flag is to be displayed at half-staff according to Presidential orders, or in accordance with recognized customs or practices not inconsistent with law. In the event of the death of a present or former official of the government of any State, territory, or possession of the United States, the Governor of that state, territory, or possession may proclaim that the National flag shall be flown at half-staff.” The code also includes other related details including the specific length of time during which the flag should be displayed at half-staff, in the event of the death of a “principal figure”(e.g., 30 days for the death of a sitting or former President, 10 days for the death of a sitting Vice-President,etc.). Bob Hope died on a Sunday, August 27, 2003. The following Monday, president George H. Bush ordered the flag of the United States to be flown at half mast. Three days after what would have been his 100th birthday, Bob Hope was given a private service which included the draping of the US flag briefly over his coffin in an early morning and private service Friday, August 1st, 2003. Hope’s widow, four children and four grandchildren reportedly declined suggestions from Washington that he be buried at the US capital’s Arlington National Cemetery, an honor usually reserved for military veterans. Whether or not the words are spoken (as in the officer’s oath), it is implied that each oath taker freely takes this oath and the responsibility for it, even if they are required to give their full measure of devotion. And it is for this reason alone that every man or woman that vows this oath, is due the honor, whether they live or whether they die in defending it! I do not mean to lesson or dishonor the service of our police, some canine service animal or any citizen of the United States. Here, we are free to believe whatever we choose to believe. I just happen to believe that only the military or upon some extraordinary occasion, should anyone’s coffin be draped with our flag, except for our military. And I care not whether the deceased has committed some crime or some grave sin or died due to suicide. As no amount of darkness can extinguish even the faintest of light; no evil can overcome the good done by just one man or one woman that stood, even for a single moment, for, LIBERTY! All such as these no matter the circumstances, are due this honor! Yes, though the U.S. Flag Code may not say what any “shall” do or “shall” not do, but rather what “should”not be done or “should” be done with this flag, it is still law and in my mind, the only difference between the words “shall” and “should” is individual choice. Though the Supreme Court of the United States has ruled that to dishonor and desecrate this symbol is considered artist expression and protected freedom of speech under our Constitution, the very flag that many oppose on religious grounds, interpret to be politically correct, it is the very same symbol that affords them the right to oppose it, interpret it and desecrate it. I will not so dishonor this symbol of Liberty nor those that fought for it and still fight for it! I am not a veteran, but many in my family and my wife’s family were. I have several friends that are veterans. Though I cannot serve and have not served nor have given my last ounce of devotion, I can do no less than to take what amount of time and effort necessary, for as long as I live, to both show respect and if possible, where an open door of utterance presents itself, to teach and show and share this flag code etiquette with anyone of an open mind and an asking heart, why I do this small thing and for whom. But this is what our flag means to me! I will clean or mend the flag as needed. And should this flag be so ordered to be flown upside down, if this nation is under distress or ceases to exist, I will not so fly it here! You may be offended by this post and this flag, hate it, despise it, spit on it, defecate on it, urinate on it, shoot it full of holes, and even burn it hatefully or mockingly, but such an idea it represents, can never nor ever can, be destroyed! I will respectfully, lovingly and proudly display this flag as I have said above, for as long as I am able or for as long as I may have others do this on my behalf. If it ceases to fly, you will know it is because of inclement weather or that I have died, but God is still alive and the very ideas of unalienable rights such as— Life, Liberty and the Pursuit of Happiness, cannot die! If these things offend you, do NOT visit us here or drive by at sunrise or sunset! I may not be able to do more for Life, Liberty and the Pursuit of Happiness, but I can NOT, do anything less! This entry was posted on November 3, 2015 at 3:16 am and is filed under American, Apple of Gold in a Picture of Silver, Declaration Of Independence, Flag, Flags, Pledge of Allegiance, RESET, The Grapes of Wrath, The National Anthem, US Constitution, USA, WE the People. You can follow any responses to this entry through the RSS 2.0 feed. You can leave a response, or trackback from your own site.